A sixth sense or one of the first five? | Stand Up and Speak Out! A sixth sense or one of the first five? On the third floor of Steere House in Rhode Island, resides a cat named Oscar. He is not the only cat to walk the halls with the residents and nurses but he seems to have a gift that the other cats don’t. Oscar sits with or sleeps next to patients mere hours before they pass. 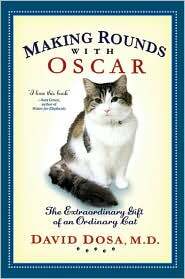 In his book Making Rounds with Oscar, David Dosa, MD, told about his experience thus far with the special cat. It was a nurse who first brought Oscar’s ability to Dr. Dosa’s attention. He wasn’t a believer at first but after observing Oscar and talking to passed patients’ families, he began to believe. Dozens of families testified that Oscar was there at the end of their mother or father’s time, usually curled up on the bed next to the patient, purring. One woman said that Oscar even stayed with her mother until the undertaker came for her, and even then he sat straight up with his paws together, as if in a vigil. As a scientist, Dr. Dosa sought a scientific explanation as to how Oscar can tell when a patient is about to pass. He came up with one solution: ketones. I’ll let the expert explain what ketones are here: “As cells die, carbohydrates are degraded into many different oxygenated compounds, including various types of ketones – chemical mixtures known for their fragrant aroma.” (Perhaps this is where the saying, “The sweet smell of death,” stems from.) He asked later, “Is it outlandish to suggest that Oscar, a cat residing on a floor where patients with end-stage dementia routinely die, has merely learned how to pick up on a specific smell emitted in the final hours of a patient’s lifespan?” It is a good question indeed and my answer to it is, no, it is not outlandish to think that way. Now, there are some people out there, like Mary, the nurse that Dr. Dosa interacted with the most in the book, who believe in a more supernatural explanation of events. For me, however, the scientific explanation is solid and conclusive. Not only does the reader learn about the cat but she also learns about the patients of Steere House and their families. The third floor of Steere House is for dementia patients. Family members, Dr. Dosa explained, often found it difficult to see a loved one continually lose memory. As the dementia progresses, the patient goes through an “unlearning” process, where they no longer know how to get dressed in the morning or even walk. One couple that stuck out in the book was the Rubensteins. They met in a concentration camp and Frank was instantly smitten with Ruth. They vowed that if they survived the concentration camp that they would meet in Frank’s hometown. They did survive and were married shortly after. They couldn’t have kids but they spent decades together. Ruth started showing signs of dementia and Frank tried to care for her but it got to be too much, even with a nurse in the house to help him. He put Ruth in Steere House and visited her every day. On the 63rd anniversary of the day they met, Ruth’s dementia had progressed so far back that she could no longer remember Frank. As he tried to kiss her hello, she screamed and swatted at the stranger. Frank’s heart was broken and he no longer visited Ruth at the Steere House, but called every day to check up on her. When he missed calling for a few days, the nurses knew something must be wrong. A friend of Frank’s found him dead in his home; he’d suffered a heart attack. One night, a few months later, Mary checked on Ruth in the middle of the night. Oscar rode the medicine cart that Mary pushed. When the cart stopped at the bed, Oscar jumped to the bed. After circling a few times, he curled up next to Ruth. After checking to make that Ruth was comfortable and that there was nothing that could medically be done to help or prolong the inevitable, Mary sat in a chair and kept Ruth and Oscar company. A few hours later, Ruth died. For animal lovers out there, especially cat people, the book is a must read. Dr. Dosa talked a lot about the effect animals have on dementia patients and their families. The book wasn’t purely about Oscar and even though the other cats are mentioned, the main theme throughout was family. It could be a human family bonded by blood or a family of nurses and patients. To know about Oscar, you must also know about the families of Steere House. Check out this video (including Judy Greer of Arrested Development fame) from House M.D. based on this cat. I need to see this episode!